Nerissa Chao, MWCT new Conservation Director, has just sent me an interesting article, published in The Economist on September 2nd. It is very complete. I offer no comment, it is rather complex. One thing is for sure: we must find ways for wilderness and wildlife to be an economic asset for those landlords to whom we ask to protect the very same wildlife and wilderness where they live. That is precisely what Campi ya Kanzi and MWCT are doing. In case the link would not work, here is the entire article. ONLY eight specimens of the northern white rhino are left alive on the planet, and they are all in captivity. The handful that remained in the wild in Congo have not been seen in years; they are almost certainly dead. A final effort to save the sub-species earlier this year saw four northern whites shipped from a zoo in the Czech Republic to the Ol Pejeta conservancy on the Laikipia reserve in Kenya. Yet the chances of saving the northern white are remote. Short of re-engineering it from frozen samples in the future, the best hope of preserving its genetic stock is to breed the last individuals with southern whites. That means the end of a creature that has probably been distinct for a million years. Indeed, the decline of the African rhino—which includes the black rhino as well as the white—is among the sorriest and most instructive tales in conservation. When President Theodore Roosevelt came to east Africa in 1909 an estimated 300,000 rhinos roamed the region. Now there are perhaps 2,000. The problem is not that the rhinos are half-blind, lumbering, and often infertile—which they are. It is economic: the ornamental and medicinal value of rhino horn makes it hard for the rhino to pay its way alive. The value of rhino horn in China, ounce for ounce, is higher than gold. It is likely to keep rising with an ageing population; in Chinese medicine the horn is ground into a powder to alleviate fevers and pain, particularly for terminally ill patients. With more Chinese contractors working in Africa, the risk of poaching seems to have increased. Market forces are insistent. Even at Ol Pejeta, which is protected by electric fences and armed guards, the horns of the four northern whites have had to be filed down to limit the risk of poaching. An inside job at one private ranch in Kenya last Christmas saw a rhino killed and its horns hacked off. The Kenya Wildlife Service later tracked down the culprits and recovered the horns, along with $8,500 in cash the poachers had been paid, with the balance payable on delivery. Sold in 10g increments in Guangzhou, the seven kilos of horn would be worth $250,000. The story of the rhino is an extreme example of a wider decline of biodiversity in Africa. A recent study by the London Zoological Society and the United Nations Environment programme claims that the population of big animals in African national parks (excluding elephant and rhino) has dropped by 59% since 1970. Poaching for meat is only part of the problem; few people eat zebra. The real pressure is from the expansion of human settlements. Population density in Africa is not high and the continent is a negligible polluter, producing less than one tonne of CO2 per head against 20 tonnes in the United States. But because most Africans depend on what they inefficiently grow or gather, and because there is little investment in sustainable farming and forestry, ecosystems suffer. According to the Global Footprint Network, a San Francisco think-tank which seeks to quantify demand and supply of natural resources, the “biocapacity” of Africa per person has fallen by half since 1960 (see chart). As smallholdings, or shambas, are subdivided, children who have inherited nothing move to new areas. More wire is rolled out, more poison set down, scrub and trees burned and water sources appropriated. This steady and silent loss of habitat—shambafication, if you will—transforms ecosystems into a monoculture fit for humans. It also fragments range, limiting the ability of wild animals to hunt, forage or migrate. Shambafication has been particularly hard on the big cats, which need a lot of space. 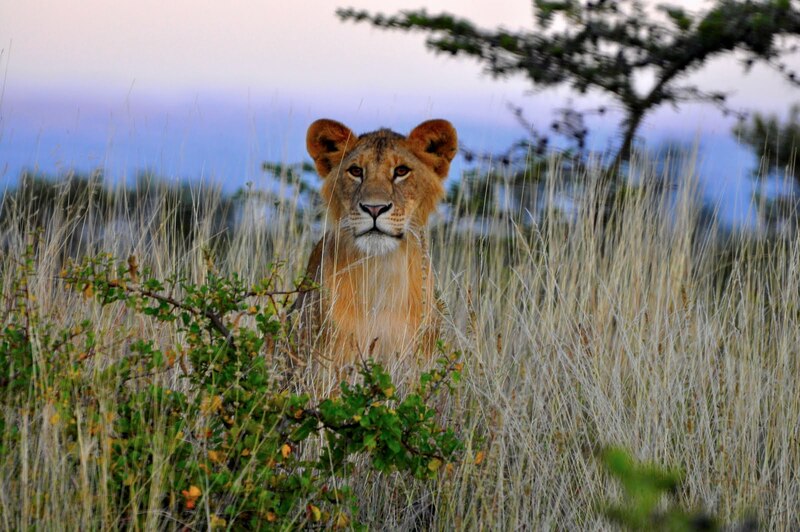 Some advocates reckon that the number of lions in Africa has dropped from 400,000 in 1955 to 20,000 today. “If nothing changes, there will be no lions left on the planet by 2020,” asserts Dereck Joubert, who heads National Geographic’s Big Cats Initiative. That may be an overstatement. Ol Pejeta had no lions until two found their way under a culvert in 1985 to start a new pride. Now there are 55 lions; 35 more have been shot over the years to control the population. “It repopulated itself,” says Richard Vigne, the head of the conservancy. Yet no matter how fecund nature is, humans are more so. With Africa’s human population set to double to 2 billion by 2050, new thinking is needed to preserve the continent’s remaining biodiversity. The first step is plain economics: a recognition that the wild has to pay its way. Take the Koyiaki ranch on the edge of Kenya’s Masai Mara reserve. The number of Masai huts on the property has increased from 44 to 2,735 since 1950. More Masai mean more cattle, carving up the vegetation and polluting the waterholes. But the cows provide the Masai with milk, blood, prestige, and a sense of belonging. The giraffe, by contrast, stands toweringly mute and uncompetitive. Just beyond Koyiaki the commercial wheat farms begin and the giraffe has even less chance of earning its way. The results are lethal: some aerial surveys suggest giraffe numbers around the Mara have fallen by 80% since 1979. Some environmental economists contend that the failure of conservationists to take local cost-benefit analysis seriously has accelerated the loss of biodiversity. They feel strongly that the private sector should step in. “Private management structures are a lot more effective in capturing the economic value of biodiversity,” says Wolf Krug, a German environmental economist. He also criticises some animal-rights groups for campaigning against hunting; that tactic, he says, devalues the animals they are trying to save. When pressed, and in private, a surprising number of conservationists say they would like to see limited hunting to provide an income stream for local communities. Some countries have had success with hunting. Namibia, for instance, has increased the absolute numbers of its game animals by allowing oryx, hartebeest, kudu and springbok to be hunted and harvested as high-protein low-fat meat for regional supermarkets. Peter Lindsey of the University of Pretoria argues that animal-rights groups are denying Africa the wise use of its elephants—whose ivory is a resource, in his view, because elephants’ fertility suggests it could be harvested sustainably. He reckons trophy-hunting in Africa is worth $200m a year: a potential bonanza for local communities. But animal-rights organisations like the Born Free Foundation object to hunting on ethical grounds. They argue that many hunters who start with gazelles end up going after predators, often illegally. And the money does not reach the locals: much of what is generated is taken offshore. The debate is bitter. The pro-hunting lobby complains that animal-righters have a lot of money to splash around, and are even writing legislation in several African countries in return for donations to government wildlife services. Hunters say their activities complement tourism: their clients are happy to stay in shabby, dusty places as long as they get their kill. But the bloodthirsty history of big-game hunting in Africa means that hunters still need to show that they have an economic value. Hunting aside, there is broad agreement on how to improve conservation in Africa. A first step is to upgrade the continent’s national parks. Outside South Africa, Namibia and Botswana these have an indifferent record, and tend to mirror the competence of their governments. There is, all agree, no chance of creating new ones; the costs are too high. But where a government has failed there may be a case for privatising park services such as accounting, tourism and even security. Indeed, it may be better for the entire management to be handed over to outsiders. The African Parks Network, a South African charity, runs national parks for several African countries. Its biggest contract is for the 1.2m-hectare Garamba National Park in Congo. The head of African Parks, Peter Fearnhead, cites Malawi as the charity’s biggest success so far. In six years a 70,000-hectare park has been restocked with animals and a tourism industry built up. For many countries the renewal of their national parks is probably the best first step in protecting biodiversity. Only 2% of big game in Uganda lives outside the country’s underfunded national parks. If Uganda were to invest in them, offering concessions to safari operators and even allowing some property development nearby, it could expand the protected area and boost earnings at the same time. Private conservancies are an even bigger opportunity. Some of these are owned by individuals or conservation groups; Ol Pejeta is a not-for-profit company with shareholders. Others are community initiatives, where local people receive an income for promoting conservation. Conservancies can earn money directly from tourism, hunting, farming, forestry and exploiting plants for medicines and cosmetics. They can also be paid for preserving a watershed, stopping flooding and runoff, or for offsetting carbon emissions. But the biggest potential is probably in “non-use” earnings, where large numbers of people around the world pay small sums to buy shares in African biodiversity not to use it, but simply because they believe its protection is important to the planet. The trick is to create a non-use market that works. A spectacular example of individual generosity is Tswalu, South Africa’s largest private conservancy. It stands high in the Kalahari desert, towards Botswana. It is a harsh and beautiful landscape, painted in shades of yellow and grey. Temperatures drop below freezing in the winter. Water is scarce. Some conservationists might sniff at Tswalu’s tarmac airstrip and the power lines running across the property. But that misses the larger land reclamation: 43 farms aggregated into a 100,000-hectare block and turned over to wildlife preservation. “Our aim is to restore the Kalahari to itself,” says Tswalu’s owner, Nicky Oppenheimer, who also serves as chairman of De Beers, a diamond firm. Tswalu’s head of wildlife, Gus Van Dyk, says that the farmers had killed almost everything that had teeth or claws. Rehabilitation is a long-term project, he says, but eagles are returning and mountain zebras are back. Mr Oppenheimer admits that the economics of Tswalu do not add up. His family puts in several million dollars a year to balance the books. It is not clear if money earned from the live-capture and sale of oryx, springbok and other animals, supplemented by earnings from a lodge that charges $850 a night, will ever be enough to make it pay. The conservancy must look after local residents as well as roads and equipment. New housing has been built, along with a kindergarten and a clinic. Making a dent in local poverty is important. Mr Van Dyk cautiously says that rates of illiteracy and alcoholism among those living on Tswalu seem to be falling. Some of the oldest rock art in the world has been found in a remote gully on the reserve. Yet the scale of Tswalu is so huge that nature dominates. “The value of this place is not what we know, but what we don’t know,” says Mr Van Dyk—the ways of the burrowing animals that live there, or the virtues of the desert grasses. Meanwhile, natural processes are returning. Lightning sets fire to dry grass. Lions drive the boks into bigger herds. As invasive species are removed, springs bubble up. This year, a stream ran for the first time in a decade. “If you give it time and space, nature is very forgiving,” says Mr Van Dyk. Just as the stately homes of Europe were forced to open up to the public, so conservancies in Africa have to open up to their neighbours. “A fortress mentality is clearly unacceptable in countries with high levels of poverty,” says Chris Thouless, a zoologist based in Kenya. This means that a conservancy has to earn more for locals than it would if they exploited the land. Because conservation in Africa has to compete at market prices and provide for locals, it will probably be forced into marginal areas which cannot be farmed. So the future for private conservation in Africa will increasingly be in drier, remoter areas. Even there, it will be expensive. Costs can be offset by selling a luxury home to jet-setters who will also receive a seat on the board of the conservancy. Or an endowment might be raised by a conservation organisation to pay for running costs. Either way, overseas capital will be needed—which could create political problems. Community initiatives may be cheaper and more politically durable. South Africa recently decided to give farmers the right to own wild animals on their land. This allows them to sell on the animals and their offspring, admit paying tourists and, in the case of rhinos, enjoy tax breaks. The result has been a dramatic rise in the number of southern white rhinos in the country: from 20 individuals in 1900, there are 16,000 now. Namibia already has 6.5m hectares of land under community projects, supporting 230,000 people. It has increased the amount of wildlife on community and private land by 60% since the 1960s. The situation is more complicated in a country like Kenya, where the pressure on land is higher. Ian Craig helped set up Lewa, a 23,000-hectare conservancy not far from Ol Pejeta. Now that a $16m buyout by the Nature Conservancy seems to have secured Lewa’s immediate future, Mr Craig has turned his attention to saving nature in the vast expanses of northern Kenya through working with communities. He maintains that “small and local” is better than “big and foreign”. His Northern Rangelands Trust, for example, is setting up a slaughterhouse so that, in return for conservation work—protecting wildlife, planting trees, keeping water holes for wild animals—Boran, Rendille and Samburu tribesmen can fatten and slaughter their cattle and sell the beef at premium prices to the market in Nairobi. The test of Mr Craig’s model will come later this year, when black rhinos will be introduced into the wild in northern Kenya without fences or armed guards, relying simply on the local community for protection. Then there is tourism. The debate here is how upmarket the safari business—looking at wildlife, rather than shooting it—should go. “As upmarket as possible,” says Colin Bell, a South African pioneer of luxury safaris. One of Mr Bell’s camps is Selinda, in northern Botswana. Its 125,000 hectares of mopane woodland and waterways are leased from the Botswana government. Security is no problem. Botswana provides its own anti-poaching patrols and the country’s president, Ian Khama, is a partner in the enterprise. The land is flat and soft, the rocks covered in layers of ancient soil. It has one of the highest densities of elephants in the world. The Selinda spillway fills with floodwaters from the Angolan hills once every 20 or 30 years, bringing tilapia, hippos, pelicans, snub-nosed ducks and rafts of water lily which locals eat as a delicacy. It is a special place—at a special price. Selinda costs around $1,400 a night, not including the cost of the small plane that gets you there. Mr Bell brushes aside complaints about exclusivity. “The best model for the wilderness is no visitors at all,” he says; if they must come, better to have a high price and low numbers. All the same, his safaris beat hunting: “Hunters get 12 visitors a year, we get 12 visitors a day.” Botswana has been less interested in fostering tourist numbers than in moving from the bargain basement of safaris to the top end but, all the same, tourism revenues have grown from $300m in the 1990s to about $3 billion today. Around 40% of the country is now under some kind of wildlife protection, and Mr Khama wants to push that higher. But the safari business has shown little interest in extending operations to Africa’s jungles or even to Francophone Africa, where wild animals are under more pressure than anywhere else on the continent. In insecure areas such as eastern Congo charities like the Gorilla Organisation, a London-based group, end up doing the hard work. Its 70,000-hectare Walikale community initiative aims to protect 750 gorillas in 80 families. The locals are keen; they have no motive to poach them. Rangers are supposed to collect gorilla stools and send them to Germany for DNA analysis. But the Walikale exists only on paper. Since it was set up in 2001, rebel activity and lack of funds have limited surveys to the most accessible parts of the reserve. Groups like Greenpeace question the point of spending limited funds and media coverage to save yet another piece of savannah when the entire Congo basin is threatened by illegal logging. The safari industry argues back that, for decades, it has stimulated interest in Africa. Nevertheless, the bling of that industry gives pause: a tent with Afghan carpets and a deep English bath, not to mention a native guard standing by with a spear, may have more to do with pampering customers than with stewardship of the land. In the end, though, there is more in play than science. In terms of biodiversity, Mr Thouless admits that Texas could serve as a safer home for rhinos than Ol Pejeta. But there are other considerations. Beauty, for instance. Mr Joubert of the Big Cats Initiative has spent most of his life photographing lions and other beasts in the African bush. “There is a spiritual value to untouched land which cannot be measured,” he maintains. “It belongs to the people who have not yet been born.” If space and silence do have a universal value, wealthy Chinese and Indians, as well as Africans, may eventually contribute to the conservation effort. For now, though, the task is to leave them something to take care of.